Above is a 1902 penny of Great Britain. 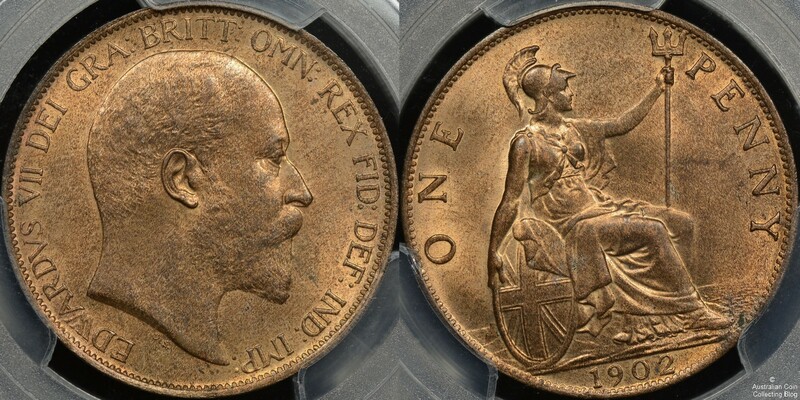 1902 was a tumultuous year for British coinage, Queen Victoria had died the year previously and an entire new coinage needed to be issued with the portrait of King Edward VII designed by G.W. De Saulles. The reverse of the penny was the same as that used on Queen Victoria’s pennies from 1895 when the classic seated Britannia design of W.C. Lyon was modified to remove the lighthouse and ship. 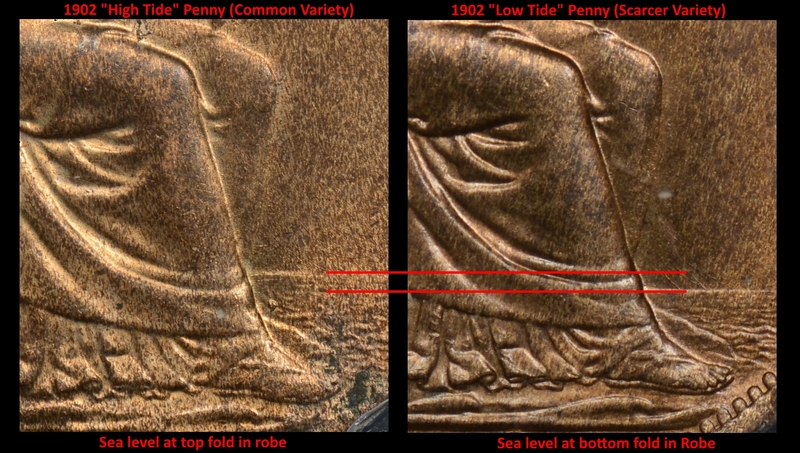 The reverse dies used prior to 1902 had a very slight die difference those used from that year forward, mainly in the sea level and where it intersected with the rocks behind Britannia and the robes on her right leg. Dies prior to 1902 are known as the “Normal Tide” or “High Tide” dies, while those from 1902 onward are the “Low Tide” dies. Both sets of dies are also known sometime as the “High Sea Level” and “Low Sea Level” dies. The variety is quite known and appears in the better English coin catalogues, Spink catalogues it as S 3990A, Freeman as 156, Peck as 2205 and Krause as KM#794.1. Almost 27,000,000 1902 pennies were minted and it turns out that some of the old pre-1902 reverse dies with the “Low Tide” were used. This resulted in two distinct 1902 reverse die varieties, the 1902 “High Tide” (seen above) and the 1902 “Low Tide” seen below. The population ratio of High Tide to Low Tide is uncertain, but some estimates suggest that 1 in 22 1902 pennies (or less than 5%) are the Low Tide Variety. This makes it a scarce coin in British terms and the catalogue values reflect this with the 2014 Spink catalogue valuing the High Tide penny in uncirculated grade at £75 and the Low Tide penny at £350 . Determining if your 1902 penny is a regular High Sea Level or the scarce Low Sea Level variety is fairly simple. Look at where the water level intersects the right (front) leg of Britannia. If the water level is on the top fold of the robe almost at the point where the legs cross then it’s the normal high tide. If it intersects with the second fold of the robe below where the legs cross then it’s the low tide variety. This is illustrated in the image below. If you’re unsure of whether a 1902 penny is the scarcer low die variety then in the words of one experienced British collector I know, assume the 1902 penny is “High Tide” and then try to prove to yourself otherwise. Looking at where the sea level intersects the robe of Britannia makes it easy enough to determine, at the cross of the legs, high tide, below it, low tide. Collectors should also be aware that the low tide variety is also present on 1902 half pennies, a coin that is harder to find even than the 1902 low tide penny. The variety on both denominations is a fun one to look for and should form a part of any collection of British coins. Bressett, K.E., 1965. A Guide Book of English Coins. 4th ed. Racine, Washington: Whitman Publishing Company. Brit Tip #13 – What’s the difference between “High Tide” and “Low Tide?”. 2016. Brit Tip #13 – What’s the difference between “High Tide” and “Low Tide?”. [ONLINE] Available at:http://wybrit.com/Brit%20Tips/Brit%20Tip%2013.html. [Accessed 28 February 2016]. Philip Skingley, 2013. Coins of England and the United Kingdom 2014. Revised edition Edition. 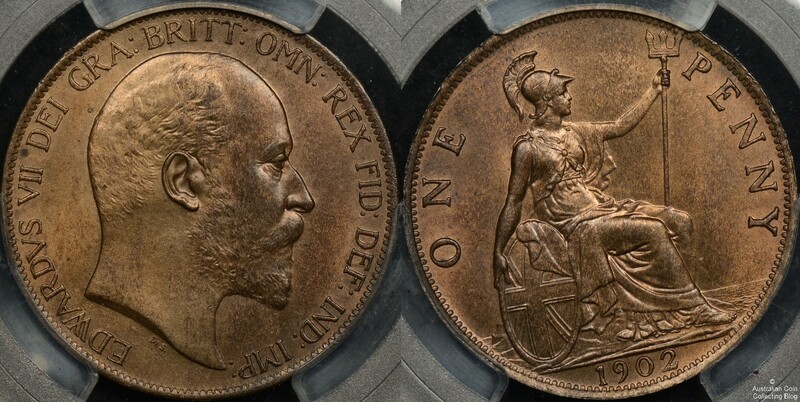 Spink & Son Ltd.
 1902 low tide penny – British Coin Related Discussions & Enquiries – British Coin Forum – Predecimal.com. 2016. 1902 low tide penny – British Coin Related Discussions & Enquiries – British Coin Forum – Predecimal.com. [ONLINE] Available at: http://www.predecimal.com/forum/topic/3927-1902-low-tide-penny/. [Accessed 28 February 2016]. Warner, S, 1998. The House of Saxe-Coburg. Australian Coin Review, 400, 30-34.